Innovative Magnetic Technologies Inc.’s Suspended Electromagnetic Separators and Electromagnetic Cross Belt / Overband Separators provide industry with powerful, cost effective, and dependable magnetic protection for large processing / production applications for industries such as Mining, Pulp Mills, Mineral Processing, Sawmills, Biomass, Recycling and Aggregate. Defend valuable size reduction equipment such as Crushers, Grinders, Chippers, Mulchers, Presses, Hogs, and Hammermills while providing a metal free product. 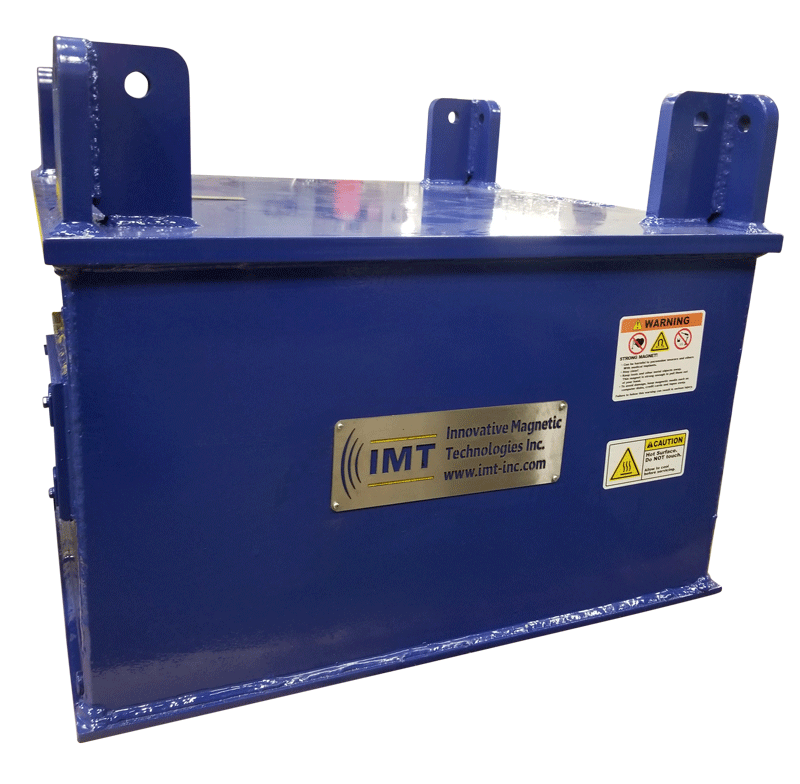 IMT’s Electromagnetic Separators are available in many configurations, sizes, and strengths to meet the most demanding industrial applications. The electromagnetic forces provide exceptional reach out for the continuous and effective removal of unwanted tramp metal. 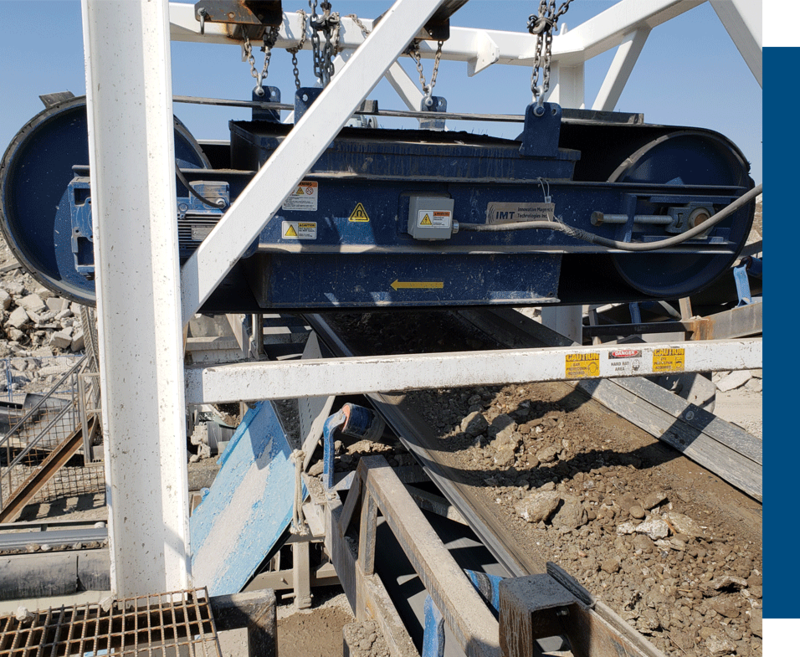 Suspended electromagnet cross belt/overband separators are particularly suited for heavy tramp volume as the cross belt configuration continuously cleans the magnet face. 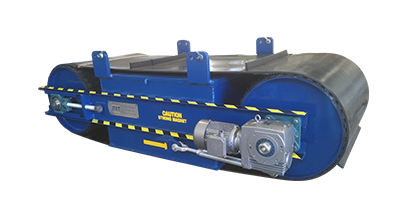 Cross Belt Separators are used in the magnetic separation of ferrous materials from products to ensure a safe, metal free output. 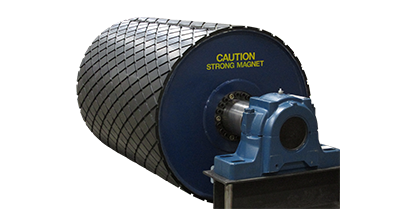 These powerful magnets are usually installed above conveyor belts, and draw the unwanted metals upwards and away from the conveyor belt to allow for uncontaminated production. IMT Suspended Electromagnets are built to withstand harsh environments and varying climates with its advanced cooling design. Be wary of air cooled electromagnets which are prone to overheating which results in poor magnetic field strength, potential tramp metal loss and downstream equipment damage. 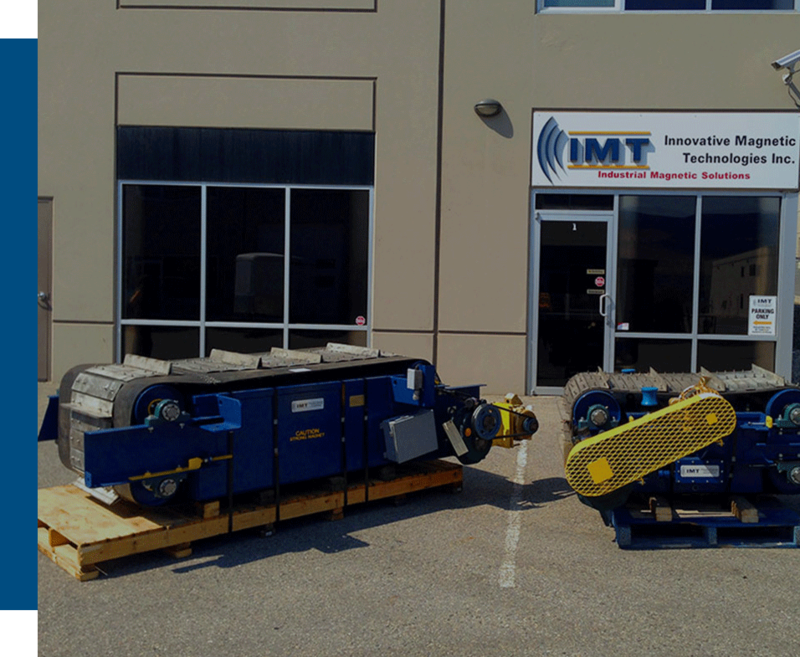 IMT stocks a wide range of suspended electromagnets for quick delivery to your plant. Contact IMT today to inquire about our attractive lead times. 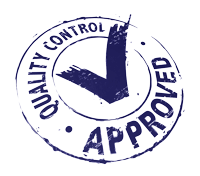 Quality control plays a critical role in all aspects and is a system set in place to help maintain standards in IMT’s manufacturing process. Custom design, fabrication and assembly involves multiple processes; it is critical to have well-documented quality control procedures. 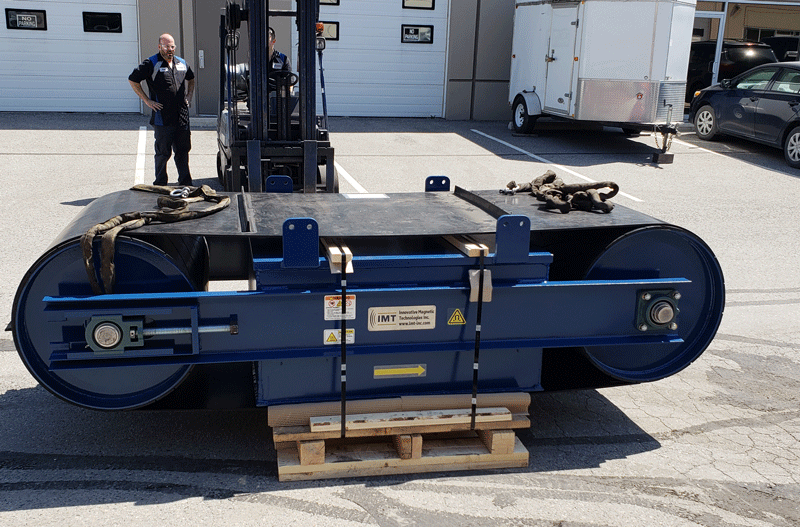 IMT operates an in-house quality assurance program following materials and components from receipt of delivery through fabrication to final product ensuring the highest quality standards are met. 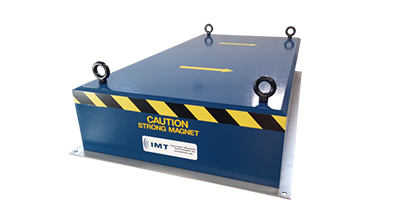 Contact Innovative Magnetic Technologies Today! Connect with experienced and knowledgeable industrial magnetic application specialists. We are ready to answer your industrial magnetic equipment questions.